We had a good visit to Tokyo in November 1993, but oddly enough I didn't write anything down about it. Or maybe I've misplaced the text. Still, I remember visiting such places as Yasukuni Shrine and its military museum, a place that raises hackles in other parts of Asia, as well as the considerably less controversial Tsukiji Market, the metro area's wholesale food market. We ate at a small sushi shop there. Expensive, but the best I've ever had. We also went to the the Yushima Seido in the Yushima district, an unusual relic of Confucian learning in Japan. According Japan Visitor, "Yushima Seido was established by the Tokugawa shogunate in 1690 as a Confucian shrine and was made a center of Confucian learning (known as the shoheiko) -- one of the earliest institutes of higher education in Japan." The place lost its government sponsorship after the Meiji Restoration, and its main hall burned down most recently in the Great Kanto Earthquake of 1923, but was later rebuilt. But that structure isn't what I remember. 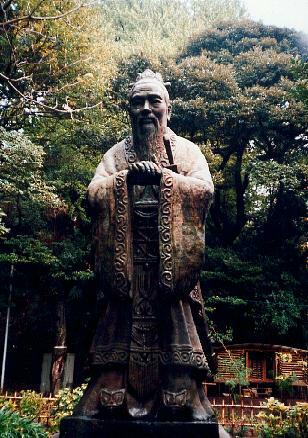 What better to have at a Confucian shrine than a tall statue of Confucius? An interesting bit of work but not, as it turned out, a particularly old one, nor particularly Japanese. Japan Visitor: "Retrace your steps back down to the Nyutokumon and out left and down a few more steps to the giant 4.57m high bronze statue of Confucius, gifted the temple in 1975 by the Taipei Lions Club." Guy Fawkes, Where Are You?